Donald Trump is officially America’s 45th president. He is also the first president for whom the VC-25As that serve as Air Force One will not be his first personal Boeing airliner. “Trump Force One” — as some have dubbed Trump’s personal jet — was one of the most visible symbols of his run for the Oval Office. Trump likes to call it the “T-Bird,” according to a Discovery Channel documentary featuring the plane. 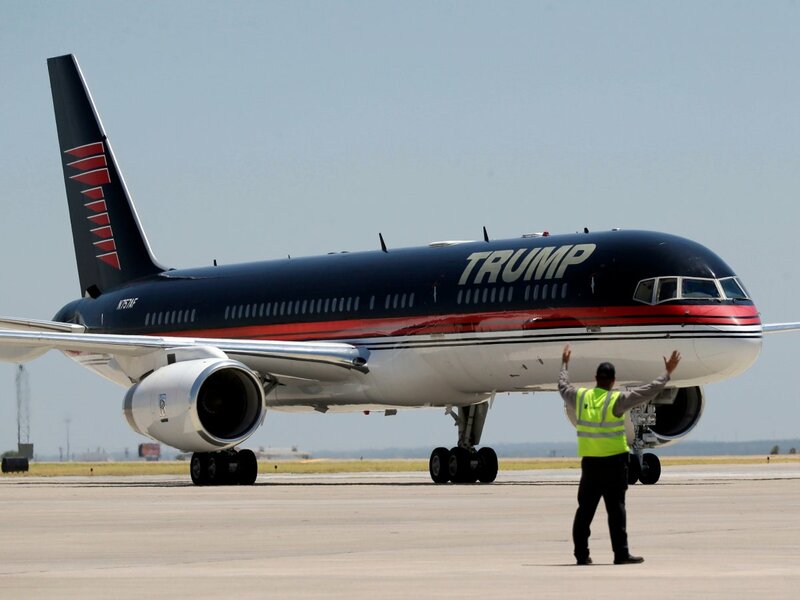 According to the documentary, the Trump Boeing 757 reportedly cost a whopping $100 million! The president has owned the Boeing airliner (registration N757AF) since 2011 and has customized the aircraft to his liking. It’s unclear what will become of the Trump 757. In all likelihood, the aircraft will be pressed into service for members of the Trump family as well as senior officials at the Trump Organization. Have a closer look at President Donald Trump’s personal Boeing 757-200 jet. Though President Trump may be the jet’s current owner, he wasn’t its first. Trump’s Boeing 757-2J4ER first flew in May 1991. The new airliner was delivered to Sterling Airlines, a now defunct Danish low-cost carrier. A couple of years later, it found its way into the fleet of Taesa, also now a defunct airline. In 1995, the jet was bought by Microsoft cofounder Paul Allen. For the next 15 years, the Boeing served as a corporate runabout for the billionaire’s various interests. In 2011, Mr. Trump took delivery of the then 20-year-old jet and added his personal touches — at great expense. The current 757 took the place of the previous Trump jet, a Boeing 727 built in 1969. The Boeing 757 is powered by two Rolls-Royce RB211 turbofan engines. The Rolls-Royce engines are a feature the president was very keen to have on his plane. Though it’s not the most fuel-efficient engine in the world, it is incredibly powerful. In fact, it’s earned the 757 a reputation among pilots for being a bit of a hot rod. In airline operations, the Boeing 757-200 can carry as many as 239 passengers, but Trump’s plane is configured for only 43. … a shower! In total, the plane is equipped with two bedrooms. In fact, virtually every fixture in the plane is 24-karat gold-plated — even the seat belts! The plane’s headrests and pillows are embroidered with the Trump family crest. Trump’s guests also travel in style. The seats have personal entertainment systems and convert into beds. … with another entertainment system. But if you want to watch something communally, then there’s the main lounge, with its 57-inch screen TV and access to 1,000 movies. Everything is controlled by touch screen — even access to Trump’s DVR. If you get hungry, there’s also a galley. Though President Trump’s 26-year-old Boeing is no spring chicken, it’s nonetheless a very impressive private jet. At the same time, nothing in the sky is quite like Air Force One. Join us at the Facebook group, Deplorable Us For Trump!